Marco Simoncelli. No, I will not pretend to have followed his career all along or to quote from rote all his podium wins or teams that he has worked with. I just know that this racer really caught my fancy in MotoGP though I have been really following it only for the past 3 seasons or so. What really interested me was the fact that he would somehow take positions from seemingly impossible places - overtaking at just the right time, taking calculated risks sometimes that even hardened "veterans" would think twice to! And that crazy hairstyle that he had - his hair peeking out from under his helmet too! I have thought that it would even slow him down sometimes! Just cannot say anymore rather than say that he will be missed. I will miss watching him on his white Honda screaming down at a turn, stick out his lanky leg and try and take the turn full on - with that stupid orange hair sticking out of his helmet, trying to fly away! I am sure he had a crazy grin (picture) stuck on his face everytime he overtook someone. Will miss you Marco! MotoGP has surely lost a "cool" racer! 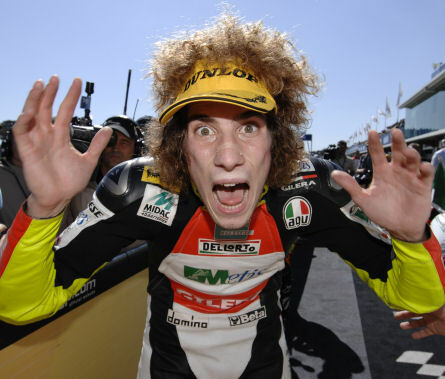 No one can ride and wear that hair quite like Marco Simoncelli. We are all saddened by his loss and he will be missed.